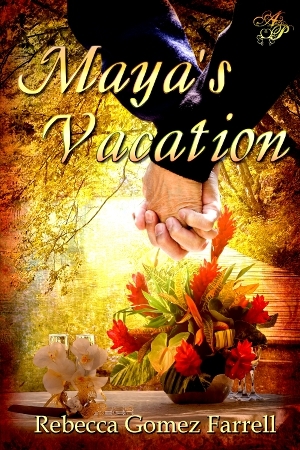 We are still on my first published book, Maya’s Vacation, in this week’s fiction bragging post, and we will be for a few more weeks — I did a number of interviews promoting it when it came out last March, so I plan to point you toward one each week. But this first one is not an interview with me. Instead, it’s an interview I did with the main character in Maya’s Vacation, Maya Holden. Perhaps she can interest you in her story. Me: Maya, you seem like such a down-to-Earth woman, but tell me, how did you end up with a litter of ferrets? Maya: Oh, that. [She waves it away with a giggle]. My husband — ex-husband, now, of course, but he was my husband then — he never let me live that one down. What happened was that Meredith Viera one day on the Today Show had these long, furry animals I’d never seen before. They were so cute, I just had to get one. So I headed to the pet store that very afternoon, and what did I find but a mother ferret with a new litter of four babies! They were all so cute, no longer than my index finger, and I just couldn’t separate them. It felt like the right thing to do, taking them all home! Chuck turned bright red when he saw them, but he never did complain, not really. He’d been married to me too long! You might say I’m a creature of instinct. Me: That’s hilarious, and don’t tell my husband, but I wouldn’t be surprised if I did something like that one day! Animals are hard to resist. Speaking of things that are hard to resist, what did you say about your first boyfriend recently? Something about how kissing him was like a great glass of tempranillo? Maya: Honey, if I were kissing Dean again, I’d drain the bottle. He was — he was something else. It was so long ago when we were together, and I was probably just giddy with first love, you know how that goes, but I can still remember how he made me feel every time we — well, you know. [She blushes]. But you can’t keep that sort of relationship forever. We’ve all got to grow up sometime. Me: Do you really think so? Don’t some people manage to capture the magic forever? Maya: I suppose I believe that. But don’t you think that sort of connection is scary? I mean, I loved Dean, I loved him so much that I moved from home at 18 to live with him in a rundown flat by the beach that I thought was heaven. We were going to be painters together, but he left and then . . . I couldn’t wait forever, could I? [She wipes a tear from her eye and breathes deeply, straightening up]. But how did we get to this topic? Let’s talk about something more fun. Me: I can certainly do that! What’s your favorite dish, Maya? What food would you want on a deserted island? Maya: I’ll take that bottle of tempranillo, for starters! But to help wash it down, I’d go for comfort food like chicken and dumplings—it might get a little lonely out on that island. I can’t help but dress up a recipe, though, so I’d stir some gruyere into the dumpling batter and probably roast the chicken first with tarragon and oregano. Me: That sounds delightful! Thank you for your time, Maya. If that little peak into Maya’s life makes you want to learn what the future may hold for her, then pick up Maya’s Vacation today! It’s available in all e-book formats, including PDF, at Astraea Press, Amazon, or Barnes and Nobles. ← Review Bragging and Winners of Maya’s Vacation!